Welcome to the Enchanting Guide for ESO. In this guide I will explain how to level up your Enchanting level fast and efficient. 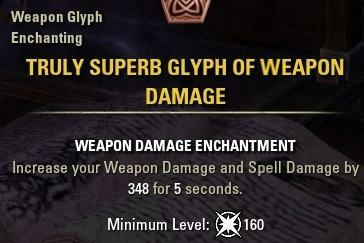 You can also find a full Glyph List Article where I show you all the Weapon, Armor, Jewelry, Potency and Aspect Runes that exist in Elder Scrolls Online. How do I level up Enchanting? 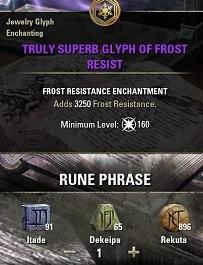 Enchanting is used to craft Glyphs. You need Glyphs to enchant armor, jewelry and weapons. This Enchanting Guide will help you understand how to level it up so you can enchant all your armor, jewelry and weapons. Every time you craft a Glyph, you will gain experience. Every time you deconstruct Items at the Enchanting workbench, you will gain experience. Higher quality items will give you more experience compared to lower quality items. Items made by another player gives the most inspiration, especially when they are better and high level Glyphs. Deconstruction always grants more inspiration than creating a Glyph. A lot of players team up and create Glyphs, trade them and deconstruct them again to gain a lot of Inspiration. Find a crafting partner who is near your crafting level. Trade the items with your buddy. Deconstruct the Glyphs made by your buddy. Repeat till you hit max Enchanting level. Note: Glyphs from another Player will give much more Inspiration experience compared to when you craft Glyphs yourself and deconstruct them. Aspect Improvement passive: Rank 1, Rank 6, Rank 16, Rank 31. Potency Improvement passive: Rank 1, Rank 5, Rank 10, Rank 15, Rank 20, Rank 25, Rank 30, Rank 35, Rank 35, Rank 40, Rank 50. You can check out my Glyph List Article to show you what Glyph does what. Make sure to have 30 Points into “The Tower” Tree to get the “Inspiration Boost” Perk that gives you 20% extra Inspiration exp. Now ask a buddy to craft you purple CP 160 Glyphs. You will need about 170 of them to get from level 1 to level 50. I would just buy the cheapest max runes that you can find in the guildstores. For example Itade, Dekeipa and Rekuta, buy 169 of them let a friend of yours that maxed out Enchanting craft them and then trade them to you so you can deconstruct them and hit lv 50 in 5 minutes. The total cost of all those runes are around 15-25k. There is three differnt type of Runes. If you want a closer look at each of them and what they do you can also check out my Glyph List Article if you want. The Potency Rune tells the Glyph what it does, for example ‘deals damage’ or ‘reduces weapon damage’. It also determines the level. The Essence Rune tells the Glyph what kind it is, for example ‘fire damage’. Level 1: Allows the use of Common white and Standard green Aspect Runestones. Level 2: Allows the use of Superior Blue Aspect Runestones. Level 3: Allows the use of Artifact purple Aspect Runestones. Level 4: Allows the use of Legendary gold Aspect Runestones. Level 1: Allows the use of Jora, Porade, Jode and Notade Potency Runestones to make Glyphs of levels 1-15. Level 2: Allows the use of Jera, Jejora, Ode and Tade Potency Runestones to make Glyphs of levels 11-25. Level 3: Allows the use of Odra, Pojora, Jayde and Edode Potency Runestones to make Glyphs of levels 21-35. Level 4: Allows the use of Edora, Jaera, Pojode, and Rekude Potency Runestones to make Glyphs of levels 30-45. Level 5: Allows the use of Pora, Denara, Hade and Idode Potency Runestones to make Glyphs from level 40 to Champion 30. Level 6: Allows the use of Rera and Pode Potency Runestones to make Glyphs of Champions 30-50. Level 7: Allows the use of Derado and Kedeko Potency Runestones to make Glyphs of Champions 50-70. Level 10: Allows the use of Rejera, Repora, Jehade and Itade to make Glyphs of Champions 150-160. Level 1: Runes are easier to spot from 20 meters or closer. Level 2: Runes are easier to spot from 30 meters or closer. Level 3: Runes are easier to spot from 40 meters or closer. Level 1: Hireling will send you runes and possibly other items every day. Level 2: Hireling will send you more runes and possibly better items every day. Level 3: Hireling will send you even more runes and even better items every day. Level 1: Increases the chancees of extracting each type of Runestone by 3%. Level 2: Increases the chancees of extracting each type of Runestone by 6%. Level 3: Increases the chancees of extracting each type of Runestone by 10%.